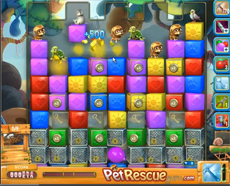 Release all the pets from their pet boxes and keep clearing the blocks till the line with the wired locked blocks. Try to smash the wires of the most locked blocks and simultaneously to release at least one key and use it to move on the level. You have to be careful not to stay out of available keys to unlock the locked blocks or not to have the chance to smash the wires around them. Can’t beat 509? This is why we are presenting a walkhtrough video in order to help you!